Celebrate Hispanic Heritage Month by creating your own mini piñata. Learn about the origins of the piñata, which many associate with the Mexican culture. Registration required. Please call the library or sign up at the children's desk to reserve your spot. Experience art in new ways through performances, snippets of conversation, hands-on art-making, and encounters with contemporary artists. Bring your work buddy, your studio neighbor, an old friend or a new date and start your evening with Third Thursday. The Third Thursday of the month is also Providence’s Gallery Night! Join free tours of numerous galleries across the city, including the Museum. Included in this month's Gallery Night is a bilingual tour by RILA's Executive Director, Marta V. Martínez. Join artist Michy Lopez and friends Francheska Acevedo (F.ACE) and Kalie Boyne for a coloring party to launch her recently produced coloring book depicting images of her favorite places in Rhode Island. Kris Fame DJs music for this interactive experience. Cash bar. Ways of Looking: Rafael Ferrer's "The Balata River"
Discover your own perspective on a contemporary painting through guided conversation. Mango is a famous fruit and flavor in Cuba and many other countries - make your own mango smoothie and learn more about Cuba. Registration requested. Please call the library or sign up at the children's desk to reserve your spot. Space limited. Also called "papitas de leche," bocaditos de leche are bite-sized milk truffles popular in Venezuela. Come make your own candies and learn about Venezuela. On Saturday, October 6, during the museum's monthly Cultural Connections program, families will be invited to make their own coffee can artwork. From 10-11:30am, RILA's Executive Director, Marta V. Martínez will lead intergenerational workshop for families. Come back on Friday, October 19 from 5-8PM for the museum's Free Friday when RILA will debut a special theatrical presentation inside the Fefa's Market exhibit at 6:30 written and directed by Marcel Mascaró and starring Magnolia Pérez as Doña Fefa. We will also unveil the coffee can installation that was created over the two week period. Food vendors and family activities by bilingual artists. Event Audience: Families. All are welcome. Celebrate Hispanic Heritage Month with cookies that honor a Mexican tradition of Dia de los Muertos. Decorate cookies in the design of traditional sugar skulls, and learn about the Day of the Dead. 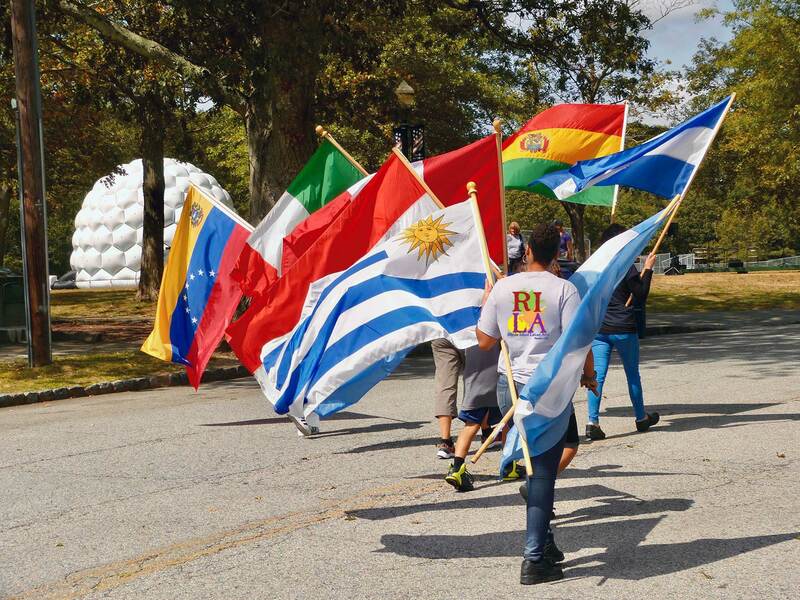 Please join Mayor Jorge O. Elorza for the Celebration of the Hispanic Heritage Month! Latino communities have collaborated to celebrate their cultures and traditions. The purpose of the event is to honor the diversity of the Latino/Hispanic culture in Providence and participate in the national celebration. We encourage family and friends to join this FREE event! There will be refreshments, delicious dishes from different countries, live music, and traditional dancers.